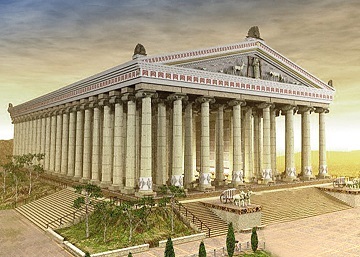 Temple of Artemis - One of the Seven Ancient Wonders of the World, dedicated to the Greek goddess of fertility, Artemis. It was located in the city of Ephesus. There were actually several temples located at the site over the centuries, two of which were considered magnificent buildings. The ground was considered sacred by local residents due to an event caused by the gods (historians believe perhaps it was struck by a meteorite centuries earlier). The most famous of the temples was built by Croesus of Lydia, which burned down in 356 B.C., on the day of Alexander the Great's birth.